Dr. Bandary has advanced training and experience in field of restorative and prosthodontics dentistry that a mature adult may require. His 25-plus years of training in full mouth reconstruction, and cosmetic dentistry and has made him one of the top dentists in his field, and he continues to pursue his studies in advanced dentistry. Dr. Bandary has treated thousands of mature adult patients and thus has a unique perspective on the particular treatments and procedures that are necessary. He also an experienced cosmetic dentist and knows how to make your smile not only functional and healthy but beautiful well. Dr. Bandary believes in friendly, personable care for every one of his patients. His practice and staff are devoted to making your experience as pleasant as possible and many of Dr. Bandary's patients have been with him for many years. Dr. Bandary, is knowledgeable and experienced in fitting patients with comfortable, natural-looking dentures that will enhance your appearance. Attractive, Comfortable, Functional, and Affordable! Dr. Bandary, Senior Dentist in Woodland Hills, has many years of experience in denture fabrication and placement and has seen Woodland Hills seniors with all kinds of dentures. Proper design and proper bite and fit, they work well, with little slipping or discomfort. They also support your facial tissues, avoiding the sunken appearance that can lead to premature wrinkles and facial collapse. 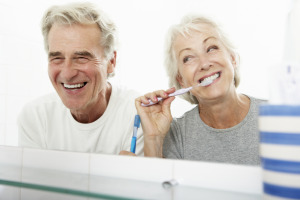 Whether you are looking for full dentures or partial dentures, Dr. Bandary can help. Dr. Bandary works with an excellent lab that does great quality work and uses the finest, most durable material to ensure your dentures will last a long time. Most of the repairs are done in our lab in the office on the same day. Also as a bio-compatible dentist, Dr. Bandary use the safest and non-toxic dental material. (please call us for more details). Dr. Bandary is certified prosthodontist and accredited IAOMT. Contact our dental office if you are interested in making an appointment with our Senior Dentist in Woodland Hills.